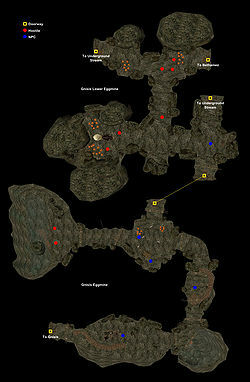 Gnisis Eggmine is a three-level kwama egg mine situated in the town of Gnisis. This egg mine has more than its usual share of interest (considering that egg mines usually are of no interest at all). Unfortunately, the economy and food supply of the town depend on the mine, and its kwama queen has caught the Blight. Relations between the polyglot Imperial, Orcish and Dunmer staff are strained following the recent murder of a miner. 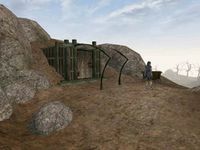 The delvings of the kwama miners have uncovered an entrance into the lost Dwemer ruin of Bethamez. 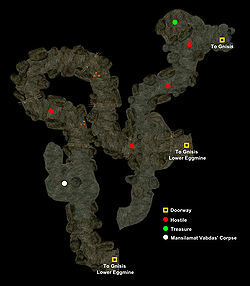 In the Underground Stream area, there is a corpse at the bottom of one of the pools of water, the late Mansilamat Vabdas. Lugrub's broken axe lays beside his body, and his ghost wanders around the same area. Also in the Underground Stream area is an Athletics skill book, The Ransom of Zarek, beside some bones and a burned out torch on a wide ledge close to the river entrance .